Used in the office or at home on the kitchen fridge (so long as it is metallic!) our animal magnets featuring Britain’s might stag will do a fine job of holding up those all important messages, reminders, recipes, cards, holiday pics…we could go on! Made in the UK, each round magnet measures 3.7cm in diameter and come in packs of 4. 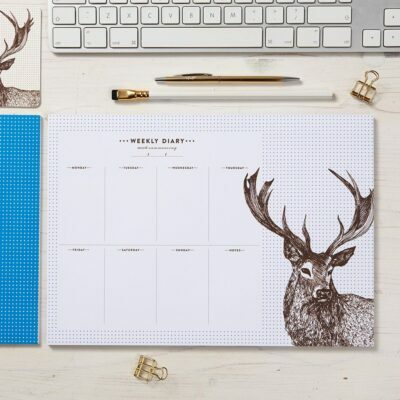 Our stag magnet pack contains 2 blue magnets with a white dotted pattern and 2 magnets featuring Cherith’s illustration of the mighty stag itself offset on a blue and brown dot-patterned background. Get the kettle on, I've lots to tell you! Be the first to hear about my sales, exclusive discounts and new collections by signing up to my newsletter below. As a thank you - I'll email you a discount code giving you 10% off your first order! At Cherith Harrison we will never sell your details to third parties and we promise to keep your information safe.